Unable to speak, Jonathan communicates via a spelling board. Through this ground-breaking system is able to construct whole pieces of writing, even featuring in The Guardian last year. His blog eyecantalk.net inspires thousands of people every day. He started a petition #TeachUsToo, which urges the government to reform the special needs curriculum so that all disabled children have the opportunity to access literacy. 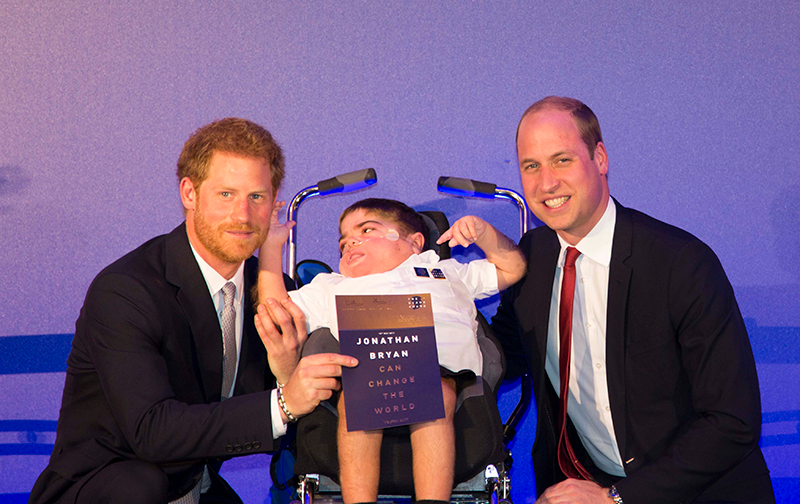 Last year, Jonathan was recognise for his determination and inspirational work with The Diana Award. Here is his story. During the summer of 2016 I was excited my life was nearing an end and I was going to Jesus’s garden. So when I recovered, I was initially quite annoyed. But then I realised I had been given the time by God for a reason. And, since then, I have been on a mission to improve education for children like me. Jonathan receives his Diana Award from TRHs The Duke of Sussex and The Duke of Cambridge at St James’ Palace. On entering the education system, I was labelled with Profound and Multiple Learning Difficulties and spent my time being amused and entertained at special school. But I was never taught to read and write. When I was in year 3, my mother took me out of school for an hour and a half a day to teach me basic words, letters and maths. By the end of Year 4, I had started to spell everything I wanted to write and say, and I had caught up academically with my able bodied peers. When I set up Teach Us Too in the summer of Year 5, I didn’t know what reception my story and campaign would get. At the time, the country was in the throes of a referendum and I was unsure whether there was space or appetite for a story like mine. But my health was fragile and I wanted to try to make a difference in the educational outcomes of children stuck in schools that were not teaching them to read and write. So I set about trying to effect change by starting a petition, and writing to ministers in education. In the meantime, the media interest was helping spread my message to the public. In November 2016 I arranged a meeting with the minister responsible for special educational needs, which I attended, accompanied by experts in the field of literacy and aided communication. One of these experts then nominated me for a Diana Award for my work in trying to make a difference. It was an immense honour to receive a Diana Legacy Award from TRHs Prince William and Prince Harry. Meeting the inspiring young people who also received the award was a privilege and I am humbled to hold the same accolade as them. Diana Award CEO Tessy Ojo shares a moment with Jonathan at a reception at Parliament in 2017. Receiving my Diana Legacy Award gave my campaign a greater exposure to a wide audience, and gave me opportunities to spread my message further. One such occasion was a reception at the House of Lords, where my mother delivered a speech I had written to the assembled dignitaries. Connections such as these are invaluable to a small cause such as Teach Us Too. 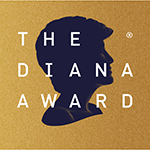 Above all I would like to thank The Diana Award for believing in me and giving me such amazing opportunities. On July 12th, my book Eye Can Write is published, with my portion of the proceeds going to the newly formed charity Teach Us Too. With Diana’s Legacy I am building my own as I seek to be a voice for the voiceless.